An outbreak of E. coli food poisoning linked to romaine lettuce has widened and has now made at least 98 people sick, federal health officials said Friday. More than half have had to be hospitalized because the strain of E. coli causing this outbreak is an especially nasty one, the officials at the Centers for Disease Control and Prevention and the Food and Drug Administration said. People in 22 states have reported E. coli infections linked to the outbreak, the CDC and FDA said. No one has died, but because the bacteria causing the outbreak is so virulent, everyone should avoid eating romaine lettuce unless it’s clearly not from the Yuma, Arizona area, the CDC’s Matt Wise said. “People should not be eating any type of romaine lettuce unless they know for sure that it is not coming from the Yuma region,” Wise told reporters in a telephone briefing. It’s the worst outbreak of E. coli since 2006 when illnesses traced to spinach killed three and sickened more than 270. A single farm in California was the source of the bacteria, which experts decided may have come from cow manure tracked into the farm by wild pigs or spread by a stream. One farm, Harrison Farms of Yuma, Arizona is the source of whole-head romaine lettuce that made eight prison inmates in Alaska sick, the FDA’s Stic Harris told reporters. “The remainder has all been chopped, bagged romaine,” he said. The CDC and FDA are checking at least two dozen farms as possible sources of contaminated romaine. The growing season for lettuce is over in Yuma, but the FDA and CDC said they could not guarantee that the outbreak is over. They said it is possible the affected romaine is still on grocery shelves or in people’s refrigerators. “If you do not know whether lettuce is romaine, do not eat it. This includes lettuce in a salad mix,” the CDC said in an advisory. “When I walk into a grocery store and I see a bag of lettuce and it says ‘Produce of USA,’ do I know it’s from Yuma? No,” said Harris. 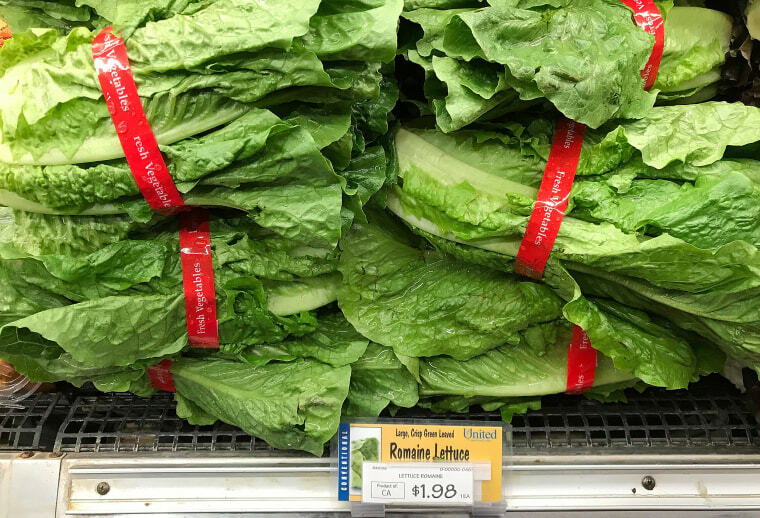 Anything that could contain romaine should be considered suspect, the CDC said. “This advice includes whole heads and hearts of romaine, chopped romaine, baby romaine, organic romaine, and salads and salad mixes containing romaine lettuce,” it said. People who think they may have been sickened by E. coli should see a doctor, the CDC advised. “This is a serious E. coli. I think everybody should be concerned and I think everybody should be avoiding romaine,” Wise said. E. coli bacteria are usually harmless, but some strains produce a toxin called Shiga toxin that can make people sick. This particular strain produces one of the worst toxins, the CDC’s Dr. Rob Tauxe said. In this outbreak, 10 people have suffered from hemolytic uremic syndrome (HUS) a type of kidney failure, the CDC said. The toxin also can cause bloody diarrhea and, if it gets into the brain, can cause a stroke. “People get sick from Shiga toxin-producing E. coli an average of 3 to 4 days after swallowing the germ. Most people get diarrhea (often bloody), severe stomach cramps and vomiting,” the CDC said. Tracking foodborne illness outbreaks can be complicated. Fresh food can be contaminated in the field, when it’s picked, during shipment, during packaging or during processing. Sometimes produce from several different farms is mixed at an intermediate facility before it’s shipped to different parts of the country. It’s not always easy to trace to one farm, and it’s possible for several farms to be the source of an outbreak strain of bacteria. “It could be two adjacent fields that share the same water source or something like that,” Wise said. Foodborne illnesses are very common. The CDC says 48 million people get sick from some kind of foodborne infection every year in the U.S.
Meat, milk, other dairy products, eggs, fresh vegetables, frozen foods and shellfish are all common sources. Harris said it’s particularly difficult to make sure salad greens are sterile. “I eat bagged lettuce a couple of times a week and it includes romaine lettuce,” Harris said.